Yesterday, team members at Everything Dinosaur received news that a beautifully preserved Ichthyosaur specimen had been discovered at Lyme Regis. Our chum Brandon, a local fossil expert from Dorset, sent us some pictures and a video which illustrate the exciting discovery. The specimen was discovered on the beach to the east of the town of Lyme Regis, near to where the council have been working to strengthen the cliff area and to improve the town’s coastal defences. The video shows the block which contains the fossil specimen, vertebrae can be clearly seen along with some of the rib bones, the skull is only partially exposed. The dig team will cut the block away from the surrounding material and carefully transport the specimen away so that it can be prepared and examined in detail. From the video, the bones don’t look too compressed or deformed and although some of the distal elements of the skeleton are probably missing, this particular Ichthyosaur looks relatively complete. It is a little difficult to get our bearings just from the video and the photographs that we have received but we think the specimen was discovered in the Blue Lias of the Church Cliffs section of beach, immediately east of Lyme Regis. The location of the fossil find. Water is carefully removed from around the fossil matrix, sand bags will be put in position to help keep the fossil material protected and then the dig team will map the exposed bones and work out the best way to cut and remove the stone block. Ichthyosaur fossil find April 2014. Carefully the specimen is exposed and then the layout and orientation of the fossil material is studied. Consideration needs to be given to the tide times as the specimen will be covered once the tide turns. The vertebrae can be clearly made out. The hand in the photograph helps to provide scale. 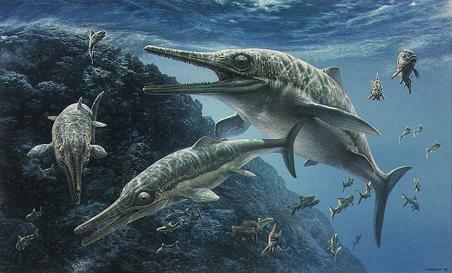 The Ichthyosaur is lying with its head facing towards the bottom right and the tail up towards the top left of the photograph. The vertebrae can be clearly seen in the picture. It is certainly a member of the Ichthyosauria Order, but it is very difficult to assign a species name to the specimen at this stage just having the short video and the photographs to study. As a guess, it might be an example of Ichthyosaurus breviceps, however, it is best to wait until the fossil material has been more thoroughly prepared before any precise identification can be made. The Ichthyosauria were an Order of fast-swimming, nektonic and (as far as we know entirely marine), predatory marine reptiles with dolphin-shaped bodies. As a group, these highly specialised reptiles evolved in the Early Triassic and thrived throughout the Jurassic and for much of the Cretaceous, before finally becoming extinct around 80 million years ago. Lyme Regis is an amazing place to visit and a fossil hunting trip to the beach is highly recommended, although we at Everything Dinosaur would advise that you take advantage of the local knowledge of a fossil hunting expert so that you can get the most from your visit. We look forward to hearing more about this exciting fossil find and no doubt there will be more marine reptile discoveries made over the next few months.